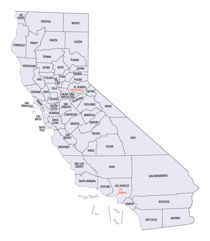 San Luis Obispo County, officially the County of San Luis Obispo, is a county located in the state of California. Based on the 2010 census, the population was 269,637. 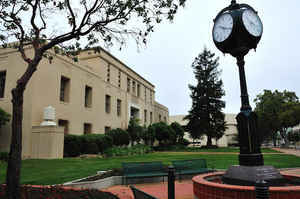 The county seat is San Luis Obispo. The county was created February 18, 1850. In 1772, the Mission San Luis Obispo was established here by Padre Junipero Serra and the county is named for Saint Luis, the Bishop of Toulouse. In 1772, the Mission San Luis Obispo was established here by Padre Junipero Serra and the county is named for Saint Luis, the Bishop of Toulouse. The prehistory of San Luis Obispo County is strongly influenced by the Chumash people who had important settlement here at least as early as the Millingstone Horizon thousands of years before present. Settlements existed, for example, in many coastal areas such as Morro Bay and Los Osos. The entrance lobby and belfry of the Mission San Luis Obispo de Tolosa. A statue of Fray JunÃ­pero Serra stands outside the church. Mission San Luis Obispo de Tolosa was founded on September 1, 1772 in the area that is now the city of San Luis Obispo. As reported by the Census Bureau, the county has a total area of 3,616 square miles (9,364 km2), of which, 3,304 square miles (8,558 km2) of it is land and 311 square miles (806 km2) of it (8.61%) is water. 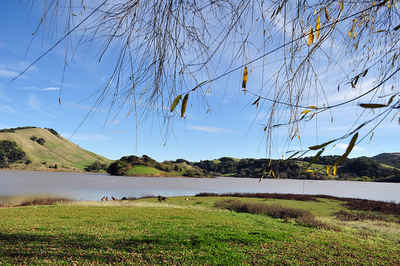 The city of San Luis Obispo is surrounded by a chain of trail-scratched Morros, long-dormant volcanoes that extend to the rolling Santa Lucia Range and the Pacific coast.